IRELAND IS THE worst performing country in Europe for taking action against climate change, according to a new report. Dropping 28 places from last year, Ireland ranked 49 out of 59 countries in the 2018 Climate Change Performance Index, issued by Germanwatch and the NewClimate Institute. This was the lowest ranking of any European country. Sweden and Norway ranked top of the index. 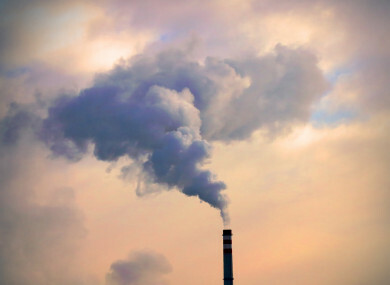 “According to national experts, Ireland is one of the few EU countries to miss its 2020 emission reduction targets under the EU effort-sharing decision, which is one reason why the country rates very low in climate policy,” the report said. Ireland produces the first highest volume of emissions per person in Europe and the eighth largest in the world, according to the report. The report noted a positive trend in the development of renewable energy in Ireland, but said that as “the current share of renewable energy in energy supply, as well as the 2030 target, are insufficient” and Ireland only rates “medium” in the renewables category. In October 2016, Minister for Communications, Climate Action and Environment Denis Naughten announced he had secured Cabinet approval to the process for the ratification of the Paris agreement to the United Nations framework convention on climate change (UNFCCC). The Paris agreement is a climate deal which was formally signed in April of this year. The deal had been finalised in Paris the previous December. It requires countries to make their own unique contribution to the prevention of dangerous climate change. Ireland, through the European Union, indicated its commitment through the agreement to reduce greenhouse gas emissions by at least 40% by 2030, compared with 1990 levels. “The Paris agreement requires that all parties produce plans to reduce emissions and adapt to climate change, and show increasing ambition over time with these plans,” Naughten said. The Paris agreement also provides that developed country parties provide financial resources to assist developing country parties with respect to both mitigation and adaptation in continuation of their existing obligations under the convention. Email “Ireland ranks worst in Europe for taking action against climate change”. Feedback on “Ireland ranks worst in Europe for taking action against climate change”.